Camping or backpacking without a campfire is simply unhear of. A source of heat, means for cooking your favorite camp-side dish, a central gathering place for camping banter, collect your fire-starting needs before you even hit the trail. 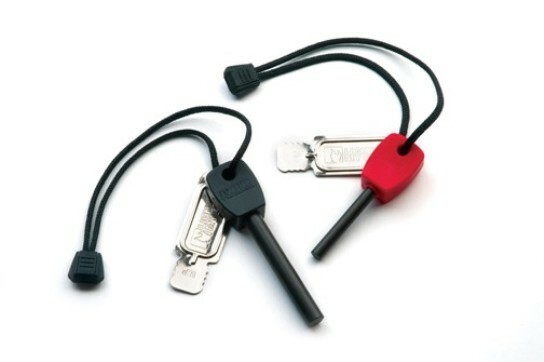 A fast, safe way to start barbeques, campfires and fireplaces. 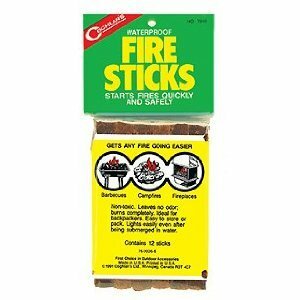 Sticks leave no odor and burn completely. Non-toxic. Twelve 5″ sticks to a package. For anyone going backpacking, hunting or camping, this tool may be a life saver. Originally developed for the Swedish Department of Defense, Swedish Light My Fire FireSteel Scout is a flash of genius. Its 3,000°C spark makes fire-building easy in any weather, at any altitude. Used by a number of armies around the world, Swedish FireSteel’s dependability makes it a favorite of survival experts, hunters, fishermen and campers. It’s found its way into cabins and backyards as a fool-proof way to light stoves and gas-barbecues. Approximately 45 wooden matches to a pocket size box. Ideal for Hunters, Fishermen, Campers or Outdoor Workers. 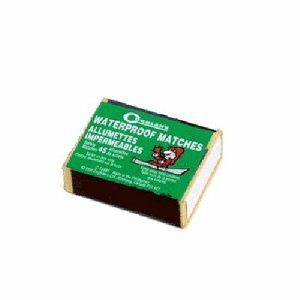 Safety Matches cannot light accidentally. Must be struck on waterproof striker surface on box.